In order for a patient to make an informed decision on whether surgery is appropriate, doctors and patients must be on equal ground regarding the specific risk factors involved. In some instances, such as with elderly patients, perhaps surgery is more dangerous than leaving a condition untreated. Surgery can have unwanted effects on the patient, such as post-op infection, and can lead to other complications requiring further treatment. The ACS Surgical Risk Calculator is a free-to-use tool, compiled from statistical data collected from just under 1.5 million patients, that allows surgeons to adjust risk factors for a more personalized risk estimate. Informed consent is an important aspect of surgery, as a patient may not always be fully aware of the risks involved with a particular surgery. Hence, the new tool may help reduce miscommunication between doctor and patient, predicting a number of distinct outcomes of surgery, based on the patients medical history, as well as 21 preoperative factors. The use of algorithms and a large bank of previous outcomes to provide an empirically derived prediction, rather than simply one surgeon’s opinion, is potentially a forward-thinking and safer technique. 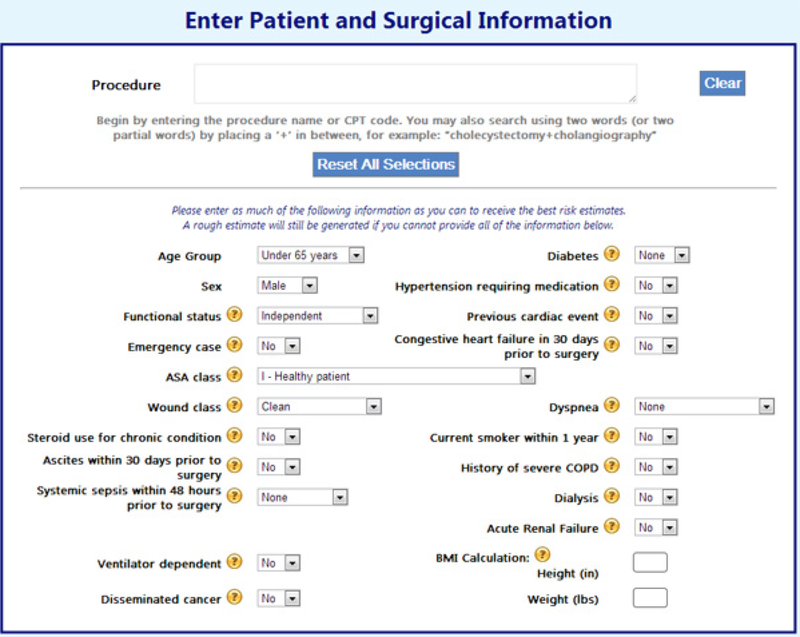 Hopefully, as the Surgical Risk Calculator becomes a more widely used tool, surgeons will be able to input a greater number of case-specific outcomes, allowing for even more accurate assessment of techniques for preoperative patients.